Damping should not be used or spring strength, unless the games settings are really rubbish, as this overrides the game settings to create a "false" feedback. The help manual for the logitech profiler explains everything pretty well. The settings for the G27 above here, are not to be used imo !!! Damping and Spring Strength should be both at Zero. Logitech G27, PS3, I did not change default settings, just not sure about linearity, I have 0, but keep trying if need to be changed. About FBB I have 70, 100, 50. - In game settings i have always 0 or 100, except for braking deadzone (10%). - logitech profiler - 200 degrees. Does anyone have this issue or know a solution? I also sent a note to Codemaster support but have not heard from them yet. I highly recomend 400 degres of rotation! It is a setting that is on rally cars and i think it is great in track racing games. Obviously for open wheel i would tone it down to about 220. But what 400 does for touring cars and endurance racing is allows you to feel car much better and lets front tires operate at optimal angles. When you turn front tires too much they won't have enought traction to turn so they essentially slide. You are still turning but have much less controll and you are wearing your tires much faster. Basicly if you hear your tires screeching every corner, you are turning way too much. I very rarely go anywhere near steering lock taking both fast, full throttle turns and hairpins with less then 100 degrees on my wheel! Most of the time keeping it withing 50 degress. Only time I am getting to the lock is when countersteering massive slides. Original settings made my G27 quite heavy to the point it was close to real car. I didn't even know that G27 was capable of such strong feedback :) But i preffer to feel trought the weel what my car is doing and you can't realy do that if your wheel motors are operating at full strenght. It basicly clips feedback information so I have it quite low. What exactly is that "Vibration Strength" for ?? Make the wheel vibrate more ?? In what situation ?? Thanx first. Wisely said. I'll try 400 then. Logitech G27 and PS3; Factory Settings except the steer strength wich sometimes i lower to 80% or even less in drift events. Since many time ago i use to the factory settings after touching controls a lot in Grid 2, F1, etc...In Grid 2 sometimes i have to use a 10 or 20% dead zone for the accelerator (gas pedal) but finally i always return to the most averages settings; i suposse i´m used to CM games and maybe not deserve for everybody, obviously, but i repeat that i was touching A LOT in the past years and at the end is always the same except little tweak for some special races but no more. IMO in Autosport i found the best and smooth response of all the CM games, realistic and predictable, as it should be. Clutch response very good and quick in G27. For DFGT wich i had in the past i´m pretty sure that factory settings are not very usable, at least a dead zone in the gas pedal is needed because of the nature of pedals in this model, very plastic feel and no opossed force in yor feet. The wheel is similar to G27 but for me is harder and the FF is more "powered" so i need to lower down all the FF sttings a 20% or so. I mean Wheel Strength instead of Sterr, in the FF section; sorry my mistake. In PS3 what i lost is the buttons assignements but not the wheel settings as FF and the other parametres. If i play around between the wheel and the controller i lost buttons asigmts whe i connect one of both (in my case buttons settings are not factory defalut). G25 PC, profiler, 180 degree rotation, 100% Overall, 0% spring/damper, return spring on with 0%, do not allow game to change settings. Quite weighty but feedback effects really come through, the kerbs feel like they are real! I have since reduced my sen to 280. Much more responsive. Finally got round to playing with a wheel on the game tonight. Very fun! Didn't have to change anything except I lowered the vibration strength from 100 to 50 because of my bony t-rex arms :x (and my flimsy desk). Feel much more in control of the car than with a pad ... but still not experienced enough to go faster. Def. need a better desk for racing on. ... Also why do I have two accounts ergh whatever. Steering Sat, Brake Sat, Throttle Sat, all 100%. I was actually surprised that these settings worked as well as they did. But I've had fun with it like this. Completely wrong approach! ALWAYS set ingame FFB strength as low as possible and max out on the wheel itself to have best fidelity. Drift 5 shows me that your settings ingame are too high. Those settings suffer from clipping badly. If you encvounter too much friction set Wheel weight to 10% if need be and drift to MAYBE 1-2. Its a matter of taste but I would try it. THere is a very interesting thread on the iRacing forums with regards to Fanatec hardware you should read. Don't havew a link for you but go and do a search for 'FFB dialling in'. Not that 'dialling in' is an option for GA but the basics are wonderfully presented in terms anyone can understand. @Loore, do codemasters have recomended in game settings? i am not that good at setting up my wheel in games. The default settings in game should be a great place to start. From there I'd just tweak little bits and pieces to get it feeling just right for you. Sorry Loore. I totally disagree. Clearly goes to show that your dev team should work more with hardware manufacturers like Fanatec. I do not believe the guys from Landshut are happy with your FFB support in games. OFC you would not get that confirmed officially. 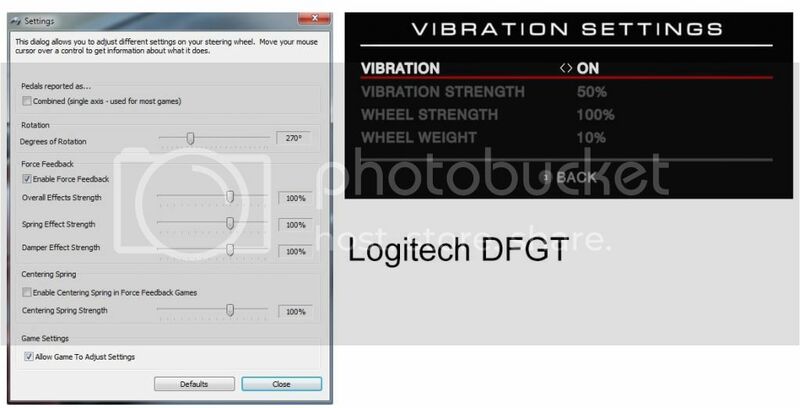 As stated in above post-to get top fidelity on Fanatec equipment have wheel settings set to a STR value of 100. Ingame I use(and everybody should to get the most out of the kit)in any of your games between 10-30% FFB strength. If you like I can deliver CLEAR and almost scientific proof, but I think you guys should do this homework and not the player especially since you charge a top dollar for a game that should have been an expansion of Grid2. It's nothing more anyways. This game don't have force feedback, why lose time? Copied the 'devicesetup.xml' & 'effectsetup.xml' from Grid 2/forcefeedback foler over respective files in Autosport. This gives me a smoother wheel turn than the gravely feel I got with the original files. Reducing the wheel weight to 10% was a revelation. Now I can feel the subtle slip effects that are there. Though still not perfect. a lot better than before. A expansion of grid 2 removing the force feedback you mean, right? this game DON'T HAVE ANY force feedback.